The role of food in health and disease. Recipes for the Specific Carbohydrate Diet. Go Ahead Honey ...It's Gluten-Free, is a web event that's has a different theme each month. This month's host is Shirley of Gluten Free Easily. The theme: Make Me a Happy Camper. Pimento Cheese Spread fits the bill perfectly. This recipe is simple and easy. It's a nice take along for a camping trip or picnic. It travels well and is great on bread, crackers or piled into a stick of celery. 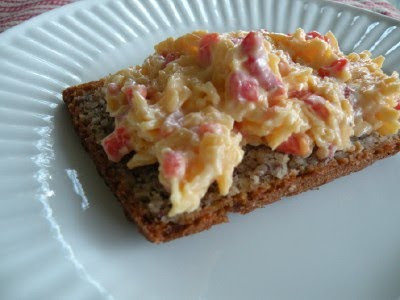 However, don't let it's simplicity fool you, Pimento Cheese Spread is the gem of Southern Cuisine. In fact, it's an icon on a pedestal all it's own. No southern childhood memory is complete without a pimento cheese sandwich served on gummy white bread. And no party guest list is complete without it. Whether it comes to the trailer park soiree dressed in an old margarine tub with an unmatched lid, or it sits next to the caviar and fois gras on a dish of crystal, it's quite simply expected to be there. It's even popular at the Masters Gold Tournament. Southerners are just wild their Pimento Cheese Spread. A few years back, the Atlanta Journal Constitution devoted their entire food section to Pimento Cheese Spread. There are lots of creative things to do with it: put on burgers, deviled eggs, make into fritters, fry it, bake it...the list is endless. The recipes are endless too. Everyone has their own rules and reasons. For me, the cheese has to be freshly shredded. Purchasing pre-shredded cheese just will not work. Perhaps it's the starches they put on it to keep the shreds from clumping that ruin the texture for me. Anyways, here's my version, it's simple and heavenly, and you don't have to be from the South to savor it. I've also included some links to articles and recipes you might enjoy. Grate the cheese by hand. In a mixing bowl mix cheese and pimientos, juice and all. Add mayo in spoonfuls until it's the consistency you like it. Season to taste. Some folks like theirs creamy and will use a mixer to blend it. This keeps well in the fridge for a few days. Thanks so much for participating in GAHIGF this month! Thanks ladies! I really enjoyed this months theme for Go Ahead Honey, we love to camp. When our schedule slows down a bit I'll get another round of research up. Research for Autism, the GI Tract, Food Allergies, Mental Health and a whole slew of Auto-Immune Issues. Recipes for the Specific Carbohyrdrate Diet and GAPS Diet. All of my recipes are grain-free, gluten-free, bakers yeast-free, refined sugar-free, corn-free, tater-free and scant in lactose. If you are following the SCD for medical reasons, please refer to the book "Breaking the Vicious Cycle" by Elaine Gottschall, or for a child, http://www.pecanbread.com/ . Many of these recipes may be too advanced. Do Gut Bugs Make You Fat? Fat or Carbs: Which Is Worse? All of Mrs. Ed's own recipes and photos are copyright 2009, 2010, 2011, 2012, 2013 & 2014. This blogsite is dedicated to Dr. Sidney V. Haas, Elaine Gottschall and Weston Price. Their lifes work has greatly improved my quality of life and that of my family. 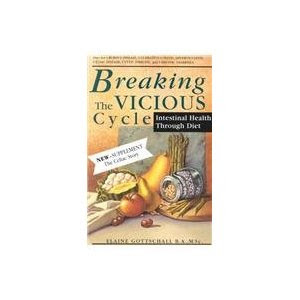 For those on the Specific Carbohydrate Diet (SCD), please use the book Breaking the Vicious Cycle, Intestinal Health Through Diet, by Elaine Gottschall, as a reference when using these recipes. If you have a child on the SCD, please refer to the Pecanbread.com website, as many of these recipes may be too advanced.